For those of us who have been waiting with baited breath for the release of the Galaxy S4, we can finally exhale a big sigh of relief, as it promises to deliver, and deliver it shall. It really is pretty! Some styling has been adopted from Googles flagship Android handset, as there is a honeycomb like texture that lives just under the surface of the Galaxy S4, much like the glittery reverse of the Nexus. The addition of a metallic band, that envelopes the whole device seamlessly, gives a premium feel to the handset. However, Samsung has chosen to stick to their guns when it comes to the polycarbonate chassis. An odd choice in light of devices such as the HTC One and the Sony Xperia Z opting for the aluminium uni-body design instead. The Galaxy S4 looks and feels like the Galaxy S3 after a strict fitness regime, and a very healthy diet. It is hard to believe that Samsung have managed to pack so much tech into such a slim device. Measuring in at 136.6 x 68.9 x 7.9mm, and a very respectable weight of only 130g, the Galaxy S4 is sure to feel more like a companion than a burden. The S4 certainly packs a punch in this department, boasting a pixel count of 441ppi, not too shabby eh? This trumps the iPhone 5, and only just loses out to the HTC One, however the display of the HTC is marginally smaller, allowing for the greater pixel density. The display itself is 5″ in Full HD (1920 x 1080) resolution , and it looks stunning. This is to be expected of a Super AMOLED display, so no complaints here. Long gone are the days of Dual-Core chips, and this is soon to be true of the Quad-Core variants too, as Samsung has somehow managed to squeeze in a whopping Eight-Cores. With the partnership of the Octo-Core Exynos 5 chip, clocking in at 1.6GHz, and 2GB of RAM, you can expect light work to be made of any task you set for the Galaxy S4. Storage shouldn’t be an issue either, coming in 16GB, 32GB and 64GB flavours, there is plenty of space for applications and media alike. And if this isn’t enough to feed your need for “MORE SPACE”, then the benefit of expandable memory (up to a further 64GB via MicroSD) is sure to satisfy. Battery life looks to be fair as well, considering the powerhouse that is embedded inside the S4, it comes as no surprise that it is also equipped with an equally impressive 2,600mAh battery. No mention of wireless charging (via NFC) as yet, but this is sure to be something Samsung are thinking about. LTE is present within Samsung’s new born, with “all frequencies and standards covered” according to the Korean giant. Good news for those of us that just can’t live without a decent internet connection. Speaking of which, all varieties of WiFi are also supported (a/b/g/n/ac), so whether in or out, you are sure get a fantastic connection. 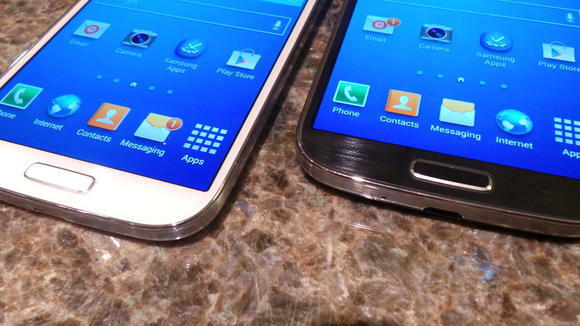 The addition of NFC makes for an interesting future with the Galaxy S4. We have already seen what other devices are capable of when it comes to NFC Tags and with ‘contact-less’ payments fast becoming common-place, it will be interesting to see what else we can do with the S4. Not wanting to be outdone, the Galaxy S4 comes ready for action with the inclusion of the rear facing 13MP AF FUll HD (60fps) and front facing 2MP Full HD (30fps) cameras. With new features such as “Dual Camera”, which allows you to take simultaneous photos/videos using both the rear and front cameras, then blend the pictures together. Android 4.2.2 is the weapon of choice for the Galaxy S4, with a polished and honed version of Samsung’s TouchWiz UI being the friendly face of it all. ‘Smart Stay’ makes a comeback, only with a facelift. Sporting a much more sophisticated eye-tracking software, paving the way for other features such as ‘Smart Pause’ which will seemingly know to pause video when you look away and resume when you gaze returns and ‘Smart Scroll’ that checks when you’re looking at the screen and will move the page as you tilt the phone back and forth. Going from a multi-touch interface to a ‘No-Touch’ interface, Samsung has included ‘Air Gestures’ which allow you to scroll through web pages, skip music and flick through picture and even answer calls without so much as placing one finger on the screen. Samsung has hinted at a mid-late April release date, with nothing being set in stone at the moment. The Galaxy S4 will be available in 155 countries over 387 carriers, so chances are you will see one in a store near you. Pricing is yet to be confirmed but we can certainly have a go at speculating. Judging by the launch cost of the S3, and also other devices currently on the market, we could be looking at a price tag of around £500 ($750) handset only, which would translate to £200 ($300) for an S4 on a contract. However, this is just my guess. The Samsug Galaxy S4 is without a doubt, a stunning piece of tech. Both in aesthetics and specifications. It comes into the market with some stiff competition from the likes of the HTC One and Sony Xperia Z, and for ‘fanboys’ and ‘fangirls’ alike it may be a bit too soon to part with their Galaxy S3’s. However, if you have an older generation Galaxy (or any other smartphone older than 2 years), it may be high-time to get yourself an upgrade. I can’t see anyone being disappointed with the Galaxy S4 in that regard. I myself have run my Galaxy S2 into the ground, with it still being my daily driver, (Sure, I’m still tied into a contract that isn’t up until September). But believe me, when the Galaxy S4 hits the shelves, I will be parting ways with my good friend and welcoming a new breed Smartphone. Tech enthusiast, with a passion for the written word. Is It Just A Paperweight, Or A Worthy Successor For The Kindle Crown? ‘Surface’ it to say, you may be disappointed.